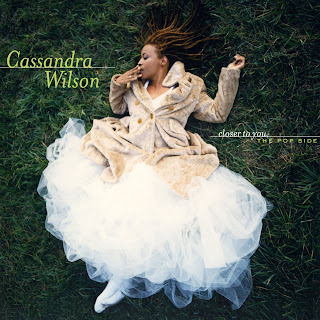 Singer Cassandra Wilson is a master interpreter of music. With her unmistakable honeyed husky voice, she has made intimate and personal statements with jazz, blues, R&B, country, and pop. On April 7, Blue Note/EMI will release Closer To You: The Pop Side, a new CD and digital collection of Wilson’s best covers of pop/rock hits, originally recorded by a who’s-who of top musicians, including U2, Bob Dylan, Glen Campbell, The Band, Sting, Van Morrison, Neil Young, Ann Peebles, Cyndi Lauper, The Monkees and The Wallflowers. Closer To You: The Pop Side celebrates the finest pop covers from Wilson’s seven albums recorded with Blue Note during her lengthy tenure with the legendary label. Her smokey, silk-laced vocals and jazz phrasing transform each of the songs she selected to record in her own style, while honoring the originals. Earlier this month, Wilson won her second Grammy Award, earning the Best Jazz Vocal Album honors for Loverly, her critically acclaimed 2008 Blue Note release. Blue Note Records is celebrating its 70th Anniversary as the world’s premier and longest-running jazz label with special commemorative releases and events throughout 2009. "I Can't Stand the Rain" was first made popular (and written by) Ann Peebles and not Tina Turner.